At VCU’s Tompkins-McGaw Library for the Health Sciences, we strive to promote health literacy every day throughout the year; however, Health Literacy Month in October provides us with a unique opportunity to promote consumer health resources to healthcare providers and their patients. The Community Health Education Center (CHEC) conducted several health literacy initiatives in celebration of health literacy month in 2018, including health literacy workshops and a health literacy information display. CHEC is a library open to the community including patients and their family members where they can find reliable consumer health information. CHEC is located at Virginia Commonwealth University (VCU) Health, a large academic medical center and is a partnership among VCU Health, VCU Libraries, and the VCU Health Auxiliary. The library contains books, magazines, Internet accessible computers, videos, a reading area, and a children’s area. The library is staffed by a full-time health sciences librarian, a library assistant, several volunteers, and a student intern. This year, the CHEC Librarian partnered with two nurses from VCU Health’s Education and Professional Development department to conduct health literacy workshops aimed at VCU clinical health care staff. The librarian along with the nurses created the workshop curriculum and conducted five sessions throughout various locations in the VCU Health system. The goal of the health literacy workshop is to teach health care providers the skills they can use in the clinical setting to help improve their patients’ health literacy abilities and increase awareness of health literacy resources and services including CHEC. The workshops provide attendees with an overview of health literacy and its impact on patients’ health. The nurses provided an overview of using the Teach Back method for effective patient education communication and taught participants how to evaluate the reading level of written patient education materials, and to assess patients’ reading level. The CHEC Librarian followed their presentation with an overview of reliable consumer health resources they can use to find information for their patients or to refer patients. 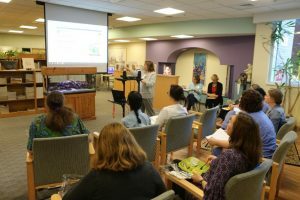 The librarian followed up with an overview of the CHEC library and encouraged health care providers to refer patients to the library. In addition to the workshops conducted at VCU Health, the CHEC Librarian was invited to conduct a consumer health class at the local Richmond Public Library (Main library branch) where library patrons were invited to attend. The librarian planned a session for patrons that included evaluating online websites and provided a demonstration of MedlinePlus and an overview of CHEC and its resources. Throughout health literacy month, we also have a health literacy display at the front entrance of the library. A digital display provides an overview of health literacy and health literacy resources. A variety of topical handouts are available for take-away. There are many ways librarians can promote health literacy. Health Literacy Month provides an opportunity to not only promote health literacy, but to also demonstrate the many library resources that are available to patients. The health literacy workshops have been successful with many health care providers attending the sessions. The health literacy display has further promoted conversation about health literacy among visitors.